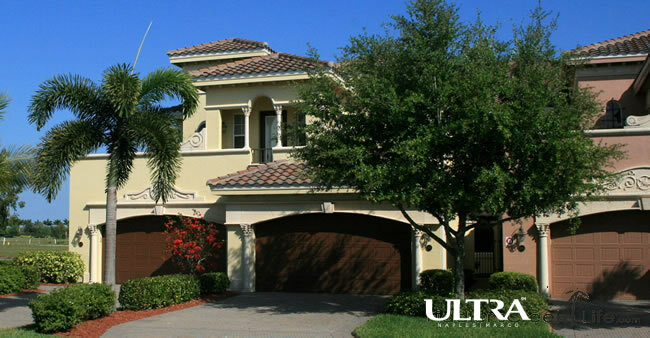 The village of Callista at Fiddler's Creek is one of the most desired communities in the overall residential project. Being just a stone’s throw from US 41, the main route to the shopping hub of Naples FL, and in the shadow of the world-class golfing and recreational facilities at Fiddler’s Creek Club & Spa, everything is within easy reach of the Callista community. Callista at Fiddler’s Creek occupies the southeastern corner of the Aviamar residential zone, incorporating the peninsular streets of Callista Crescent and Callista Mar Way, as well as the short section of the southern Aviamar Circle that stretches between them. Numbering 17 coach homes when fully completed, the design of each complex means a total of 156 Callista condos will be available in total. Of course, each Callista condo is built to the highest construction standards. They have a Mediterranean style, and boasts a brick-paved driveway, a large two-car garage and a spacious lanai at the rear from where an excellent waterside view can be enjoyed. There is also a Callista community swimming pool where residents and their families can lounge in the sun and swim. Dafne covers a total of 3,235 sq ft with 3 bedrooms, 3 bathrooms, and 2-car garage included in the floor plan. Edera covers a total of 3,304 sq ft with 3 bedrooms, 3 bathrooms, and 2-car garage included in the floor plan. Geranio covers a total of 3,424 sq ft with 3 bedrooms, 3 bathrooms, and 2-car garage included in the floor plan. Giglio covers a total of 3,899 sq ft with 3 bedrooms, 3 bathrooms, a study, and 2-car garage included in the floor plan. For more details on the village of Callista at Fiddler’s Creek and the selection of Callista condos, call us today.